Home » Blog » Habemus Papam!! When I awoke this morning at 6am, and saw my Pope Alarm, had been activated only 30 minutes prior to declare: “We Have a New Pope” I couldn’t believe it, truthfully I thought perhaps I was misreading. Flicking over to EWTN to watch live I saw it was indeed true, running around the room bouncing with joy, silently screaming, “We Have a Pope! !”, I restrained myself for the next half hour and let my family sleep a little longer. With tears streaming down my face in joy and awe I watched live the new Holy Father, Pope Francis’ first public appearance. The crowd’s excitement, when he greeted them all so casually, “Good Evening” they went wild, the bells were pealing. His humour, “My brother cardinals had to go to almost the ends of the earth.”. As he lead us in prayer praying for our Emeritus Pope, and the moment, the moment I could continually watch when he asked for the people to bless him and humbly bent his head forward, that incredible crowd of people were silent as they prayed for him. That was awesome, absolutely awesome!! After watching a bit, I woke up my family, sharing the news with them, “We have a Pope, Pope Francis”, Jem(4) joined me declaring to his older siblings, “We have a new Pope!” so sweet. Jelly Bean(8) broke into a well known song about “Argentina…” It wasn’t long before I could no longer restrain myself and rang my College children and brothers, I thought I might wake them, but they were all awake, Papal Alarms had told them too, and one brother hadn’t even slept waiting for the news. He’d roused my son and flatmates to pray the Rosary for the Holy Father at 5.30am. All week the media, particularly the secular media have spent time trying to foretell who was to be the next Pope, I had just laughed to myself. A ridiculous waste of time, the Holy Spirit is in charge here, He will guide, it was really no surprise to me that ‘an unexpected’ Cardinal was selected. He is in charge. Oh the joy when Our Holy Father gave us the traditional Papal Blessing, the Urbi et Orbi, to know that not only were the pilgrims in St Peter’s square covered in his blessing, but so were we who were watching around the world via the media. Christ promised us he would always be with us, ” You are Peter, and upon this rock I will build my Church, and the gates of hell will not prevail against it” (Matt 16:18), such an assurance, watching such a monumental moment brings me awe, awe in His promise to always be with us, awe of Christ. Recently I have been troubled, during the Papal Blessing I felt an incredible reassurance, an immense sense of peace, a lifting of my burdens. Today the universality of the Church was so tangible, what a moment in Christendom! 7 Comments on Habemus Papam!! love love lve your pist Erin. I was going to call you when the children were at school but the day just slipped through my fingers. Was PC up with you? I think that having Steve up with me, contained me from waking the children. I really should proof read before hitting submit. Gosh, I felt that I could have written this, Erin (not so well, though!)! I woke up our children, too, and that emotion – wow! I've felt troubled since Pope Benedict resigned and even while we were waiting, I was excited but apprehensive. Then, he came out and I felt that reassurance, too! I felt Our Lady gently reassuring that it was all right and the joy just overflowed. Loved him straightaway! Oh, lovely Post Erin. I've felt such joy and excitement all day. 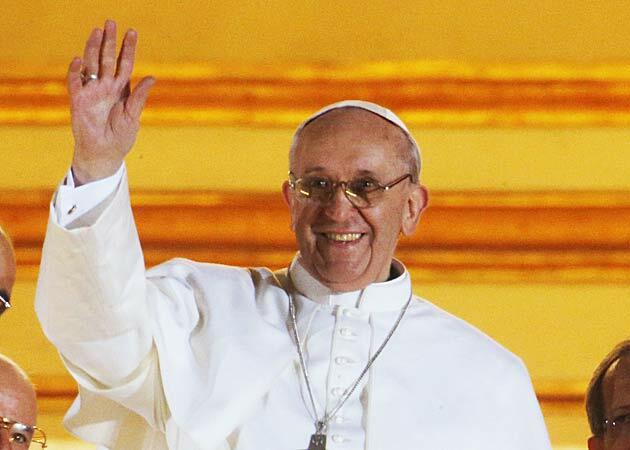 It is just sooo exciting to be blessed with Pope Francis! I taped EWTN before bed last night and then watched for the smoke upon replay this morning, kids were around too and we enjoyed saying Habemus Papum!! Your post and excitement is so sweet and brought a big smile to my face and a tear to my eye, despite me not being a catholic. Congratulations. I just tagged nominated you for "Five Things" and the Liebster Award. If you're interested in participating, the details are in my post today (3/18).